There are a lot of reasons why you might need to replace your passport. Even if your passport has years of validity remaining, you might find yourself needing to replace it because it was lost or stolen, or because you’ve changed your name or run out of blank pages. We’ll explore all the reasons that you might need to replace your passport, and show you how to get a passport replacement quickly and easily. Can’t find your passport? If you’ve searched everywhere and your passport is nowhere to be found, you’ll need to replace your lost passport. The procedure to replace a lost passport is similar to getting a passport for the first time. It uses the same passport application, Form DS-11. The most important requirement to replace a lost passport is proof of your US citizenship. You can submit either your original birth certificate showing birth in the US, your original naturalization certificate, or you can even use an old US passport! In addition to passport application form DS-11, you’ll also need to submit Form DS-64. This is a statement that explains how your passport was lost. You’ll need to visit a Passport Acceptance Agent in order to begin your application. Since your most recent passport was lost, the Passport Acceptance Agent will need to review your documents and verify your identity and US citizenship before a replacement passport can be granted. If your passport has been stolen, you’ll need to follow the stolen passport procedure to apply for a replacement passport. This process is almost identical to the lost passport replacement process. You’ll need to visit a Passport Acceptance Agent, and you’ll need to submit proof of your US citizenship, passport application Form DS-11, and Form DS-64 to explain the circumstances under which your passport was stolen. Many people think that a police report is required in order to replace a stolen passport. This isn’t the case! You can replace your stolen passport with or without a police report. We do recommend that you file a police report if you have been the victim of a violent crime, a major burglary, or if you have had other identity documents stolen along with your passport. A damaged passport is bad news. Severely damaged passports are considered invalid by the US State Department. This means they can’t be used for travel, or to prove your identity and citizenship! If your passport has problems like a torn or missing cover, ripped or cut pages, or unauthorized markings on the information page, you’ll need to replace it using the mutilated passport replacement procedure. Like the processes to replace lost or stolen passports, the mutilated passport procedure requires the use of application form DS-11 and a trip to a Passport Acceptance Agent. You’ll need to prove your US citizenship by providing your original birth certificate, naturalization certificate, or an older, undamaged passport. You’ll also need to write a brief letter addressed to “US Department of State” explaining how your passport got damaged. In some cases, your passport might be in poor condition but not badly enough damaged to be considered mutilated. If your passport has minor issues like a small amount of water damage, warping, or the edges of the pages fraying and curling, your passport is still valid under US law, but you may have problems when you try to board an international flight or enter a foreign country. If you are concerned about your passport’s condition, you can apply for an early passport renewal to get a fresh book with a full 10 year validity. Frequent flyer? If your passport is full of entry stamps and visas and you need additional pages, you’ll need to replace your passport by applying for a passport renewal. The US State Department used to have a special service to add blank pages to valid passports, but that service was discontinued on December 31, 2015. The good news is that when you apply for a passport renewal, you can request a large book that has 52 pages instead of the standard 28. 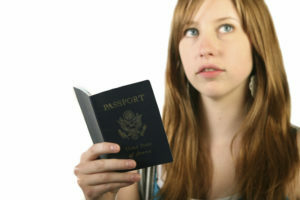 Large books are issued at the discretion of the passport agency, but there is no additional fee to get the big book. A new name means it’s time for a new passport! Many years ago, the US State Department used to change the name on valid passports by typing an amendment onto one of the back pages of the passport. No longer! The current standard is that if your name has legally changed, you’ll need to replace your passport and have a new one issued in your new name. The procedure used to replace your passport due to a name change varies according to how long it’s been since your passport was issued. If your passport was issued less than one year ago, you can change the name using the passport re-application service. The nice thing about this service is that you don’t need to pay the government fee for your passport book again! Passports that were issued more than one year ago will need to be renewed in order to change the name. You’ll need to submit the original or a certified copy of your name change document (i.e. marriage certificate, divorce decree, or court order for name change.) If you’ve already changed the name on your driver’s license, you should also submit a photocopy of it.